Righto!, now that we're all fed and watered, lets strap ourselves back into our seats and take up our story where we left off. For those of you who haven't read Part 1 of 'The Quest for the Emerald Orb' you are advised to bring yourselves up to speed now, otherwise this is all going so seem like a lot of twaddle...what's that you say?...Part 1 was a lot of twaddle anyway...Phoo, shame on you! We take up our story just as the unfortunate Oberst Fleihoffen's Company of Prussian Guards have been ambushed by the unspeakably horrid, flesh-eating, brain-craving Zombies at the site of the Ancient ruins. Overcome with fear and loathing the two leading members of the company quickly succumb to the clawing, groping zombies. Dice throws of 9 and 10 on their wound table means they've just joined the ranks of the walking dead...the horror, the horror!! Whilst his men are grappling with the zombies, the Oberst demonstrates his sense of purpose and fortitude under pressure by seizing the marker which is lying at the base of one of the ruined columns to confirm its validity. "Schiess und Blitzen!! Das marker ist eine scheissen fakeren"...said with a guttural german accent which probably doesn't require translation. H.M Aboukir arrives on the scene. Meanwhile H.M Gunboat Aboukir has arrived at the designated rendezvous point on the Imbulu River but where's Sir Percival and the rest of his party? Not being one to sit on his chuff and wait, Lieutenant Makepiece decides to leave a small force guarding the gunboat with strict instructions to issue three short blasts on the steam whistle should the British Expedition make an appearance, whilst he sets off North with a party of Marines in the direction of the Native Village. As the impatient Lieutenant and his men advance cautiously up the narrow jungle trail the eerie silence is shattered by the spine-chilling war cry of the Snoozenuluzem warriors bursting forth from the dense undergrowth like avenging banshees. "Arghngmbugu gahrglumbulu *@#*!!" they yell, which roughly translates to "I've got first dibs on the tasty fat one for my supper tonight!!" Snoozenuluzem warriors with stolen Zulu shields..what the? Te he he, they'll never guess were in here. Taken completely unawares the redoubtable Lieutenant barely has time to order "Fix bayonets! ", Fortunately the tars had the good sense to fix bayonets before setting out and are ready to give as good as they get. A fierce melee ensues and two ratings are felled with spear wounds to the throat and chest but not without taking a couple of the savages with them. Alarmed and over-awed by the White Pigs 'firesticks that belch flame' the natives decide to call it a day and retreat to the safety of the jungle from whence they came. Clearly the white pigs witch doctors have some very powerful ju ju! Looks like meat's back off the menu. I told you we shoulda joined the bleedin' Catering Corps! Dusting down his tunic and straightening his tie Lt Makepiece ponders his next move. The road ahead appears to lead to what looks like some Pagan statue. Surely a likely place to look for the Orb...."I say men, I think we'll take a shufti at yonder statue thingy". While all this drama is unfolding our two teams of Intrepid explorers are cautiously making for the bridge. Clearly neither party has the Orb so by incredible powers of deduction they both figure it must be on the North side of the Imbulu River. Luckily for the Baron he is closest to the bridge so, risking all, he and his party break cover and make a mad dash across the wooden bridge, stopping occasionally to trade pot shots with the British Expedition and losing another lackie in the process. They race torward the sound of gunfire in the distance which can only be the Oberst and his men. The Baron makes a dash for the North bank. Sir Percival, cheered by the sight of H.M Aboukir and aware he now outnumbers the Baron, presses on to the bridge with all haste. "We must get to that dashed egg before that swine Schlessinger or Her Royal Personage will not be pleased"
"Press on with all haste old things"
We return again to the Naval types who are making their way to the Northern-most edge of the table to check out the Pagan Statue. As they reach a fork in the trail they spy the Prussians who have just finished-off those disgusting Zombies with the butts and bayonets of their Mauser's and a couple of swift kicks in the nads for good measure!....YUK! I bloody hate Zombies!! The ruse works like a treat. Unsheathing his saber the Lieutenant orders his men, in his best parade ground baritone, to "Charge those bloody Prussians, they've got the Orb!!" Mein Gott! Vat next? thinks Oberst Fleihoffen, first Zombies now men in funny straw hats and sailor suits. Oh well, our bullets don't mind how they're dressed, "Rapid Fire Mein Leiblings", and the Prussians let fly just as his fellow country man, Baron Von Schlessinger, arrives on the scene. "Guten abend Herr Baron, nice of you to join us, you wouldn't happen to have The Emerald Orb in your possession by any chance?" "I was rather hoping you did" replies the Baron. Both the Prussians and the Baron and his crew carry on a rather inneffectual fire against the rapidly advancing British Naval types, completeley oblivious to the fact that Sir Percival and his party have crossed the river. The ragged volleys from the Barons poorly trained thugs and the Oberst's troops more accurate fire account for two Marines. The plucky tars hit back with a telling fusilade that sees one of the Ribbentrapp twins take a hit in the thigh and a number of suppression markers on the others. "This is no place for me" thinks the Baron, "best to let the professional deal with it" and with that the Baron and the remnants of his ragged crew scarper for the relative safety of the rivers edge with the Marines hot on their tail. On finding the German steamer Der Kestrel unguarded the Brits plant a Moresby, Mk 2, timed, implosion device, (which they just happen to have handy in one of the pack mules saddle bags), in Der Kestrel's wheel house. "That should put paid to the blighters escape" quips Professor Yeatman-Briggs, who is something of an incendiary expert when not lecturing on Languages of the Indigenous Races of Africa at Oxford or indulging his passion for 'Javanese Umbrella fighting' down at the bullpit. With that out of the way they press on toward the edge of the jungle and the, now almost continuous, sound of gunfire. Then suddenly above the din... WHOOP - WHOOP - WHOOP!! It's the Aboukir's steam whistle. At this point things become a trifle confused, and quite frankly, if you've managed to keep up with the play thus far you've all done very well indeed. Looking at an aerial view of the situation at turn 9 (see below) we have the Baron and his lackies about to leg it, leaving the Prussian Guards involved in a sniping duel with Lt Makepiece and Her Majestie's Marines, Sir Percival's lot about to probe the jungle on the North bank of the river and bands of savages lurking with intent God knows where! To cap it off the long shadows signify nightfall is rapidly approaching..
Situation at around turn 9. On hearing the Aboukir's steam whistle Lieutenant Makepiece orders his troops to break-off the engagement and retire in good order back to the gunboat. Clearly Sir Percival and his party are in sight and his primary objective is to extricate the Expedition, hopefully with the Emerald Orb in tow, back to safety before nightfall. Unaware of the significance of the whistle blasts the Oberst rapidly sums up the situation thus: the Baron's done a runner, the dark is closing in and there's no sign of the prize... it's time to make a strategic withdrawal. He checks his compass bearings and plots a direct route back to the river and the waiting Kestrel, "Follow me men, the way is vorwarts!" As he ascends the summit of a gentle slope he can just make out the muddy brown ribbon of the Imbulu River and the gleaming white paintwork of der Kestrel but "Voss ist loss, Ach!! diese sheissen Britisher schweinhunds are blocking meine vay!!" Apologies for annihilating the German Language, too much reading Commando and Valiant annuals I'm afraid. They had suffered less casualties. Their means of escape was intact, untampered with and waiting to sail. They had come closer than the others to picking the correct location of the Orb. They were British and frankly a much better type that the others so they deserved to win. Of the fabled 'Emerald Orb' nothing was found, but rest assured the Adventure continues.....fade to stirring strands of adventurous sounding music. The Professor in thoughtful pose. Oh, hurrah and well played! One in the eye for old Fritz, eh what? Excellent charcterful fun! I can't wait to have a go at something similar. 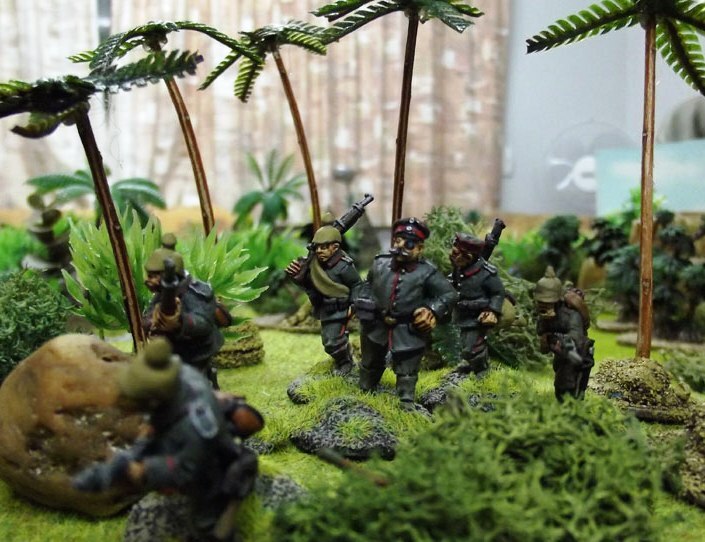 Really nice mix of models and terrain, and an intriguing tale to boot. I liked the natives name too, put me in mind of the carry on film up the jungle or whatever it was called with the quest for oozelum bird... great fun. One point for your blog - add a label "Battle report" as these sort of posts seem to get the most views! Looking forward to reading your future reports. Thanks for the kind words chaps. The Captain is always receptive to fullsome praise and sound advice so from now on look for 'Battle Reports'. (Thanks Scott) I'm looking forward to seeing those pirates of yours in action and the ensuing battle report. From what I've seen of your impressive models and scenery you cant be far off putting on a game. Cheers Rosbif & Dean...British pluck and playing a straight bat always seems to do the trick. You had me at zombies mate, bloody good narrative, bloody good miniatures, just bloody good. Excellent fun by the look of it. Jolly good show! Well my esteemed colleague, half a brain is better than no brain and personally I beleive too much thinking about serious stuff and not concentrating on nonsense is the root cause of the malaise we find ourselves in. You wont be too surprised to learn fellow readers that the German Embassy has issued a strongly worded statement to our Governmant protesting at the unfair and one-sided manner in which the 'Congo Incident' has been handled by Yours Truly, dire mutterings of trade embargoes and war are being treated with the usual contempt such drivvle deserves!! And rightly so, Old Chap! Let the Deutchies and their Uber Allies stamp their jackboots as much as they like! Keep Africa British, I say! Too much sausage and not enough beef - that's their problem! Really enjoyed the look and read of this lighthearted romp. Most excellent! You have some marvelous terrain and toys there sir - keep up the good work!! Sum of me wee plastics.